Florida's Malevolent Creation have never been as notable or enthralling to me as peers like Deicide or Obituary, perhaps due to the lesser sense of identity that drives them compared to the rabid hateful Satanism of the former or the zombified rot inherent in the latter. Nowadays Malevolent Creation seem to be better known amongst metalheads for that song where they dropped the n-word than their actual music, which is a shame because the band have always been a more than solid outfit, combining crusty death metal with a thrashy speed and intensity to make a compelling racket. They've had plenty of great musicians in their ranks over the years after all, including drummers Derek Roddy (Blotted Science, Hate Eternal) and Tony Laureano (Angelcorpse, Nile), and although you'd not think of them as tech-death there is skill beneath the brutality. Having fallen on tough times lately with the lineup switching almost entirely in 2017 before the death of long-term vocalist Brett Hoffman last year from cancer, founding member and guitarist Phil Fasciana deserves real kudos for keeping the show on the road. Yet it's a shame that The 13th Beast doesn't contain much memorable material. 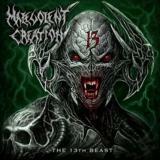 Although as fast and straightforwardly brutal as you'd expect, Malevolent Creation have always been better at the blunt impact than the lingering wound, and this, their thirteenth (duh) full length is no exception. A brief sample introduces opener End the Torture before a mid-paced rumble, some solid Cannibal Corpsean groove between widdly solos absolutely solid but equally nothing that any death metal fan hasn't heard hundreds of times before. There are highlights despite that poor start; Mandatory Butchery initially seems to more or less continue in the same vein as practically the same song before ramping up the tempo for some Angelcorpse-esque blackened speed, continuing along a more grandiose path. Tracks like Agony for the Chosen, The Beast Awakened, or Bleed Us Free may seem to follow more or less similar paths if not being downright interchangeable but you can't discount the intensity and necksnapping energy that each pumps out. And the rare tracks that do different things, such as the slow, groovy breakdown in Born of Flesh, makes the surrounding gallops hit all the harder; it's just a shame that there's not more of these moments to make the album feel less repetitive, which it would even if it weren't near fifty minutes' length. Blame the writing, not the musicians; new vocalist/guitarist Lee Wollenschlaeger has a more than solid bellow in the Hoffman vibe and seems to keep up with Fasciana's constant outpourings of riffs, and new rhythm section Josh Gibbs and Philip Cancilla more than earn their spots, the production allowing the bass space to shine and the drums being a furious pounding that gives the likes of Canvas of Flesh an extra bit of Bolt Thrower-esque presence, as does the slower, crushing Release the Soul. The swirling riffs of late-album highlight Trapped Inside are intense enough to earn Immolation comparisons and that sort of complex heaviness would be a good path for Malevolent Creation to take in the future; yet as it is, this is an album that hits fast and hard, but leaves nary a bruise on the flesh.